We recently told of how Bebe Cool and Bobi Wine had set their album launches on different dates for the first time in three years. The dates for Bebe Cool's Kamwako launch are still set to take place on the same dates and venues. Bobi Wine has now come up with a new date and location and this time he says its now official implying that their won't be any more changes. Bobi Wine confirmed this in a message off his official wall. "Now it is official, 16th November at Lugogo Rugby Grounds, 17th Satellite Beach Mukono and Sunday 18th at One Love Beach, Busabala....We shall be in a Concert dubbed Tugambire Ku Jenniffer. It's gonna be extra ordinary." What is clear is the date but with a bit of mix up between Kyadondo on his poster and Lugogo in his facebook post but that's no big deal as they are more or less in the same walkable distance. Last year, the 'Matyansi Butyampa' Concert and the 'Minzani' Concert were held on the same day making it the fourth in a row of concerts between these two that were held on the same dates that include: (Agenze Vs Carolina), (Bogolaako Vs Wesontinge) and (Kasepiki Vs Kataala). It's important to note that this trend has changed after the battle of champions was held between the two artistes. 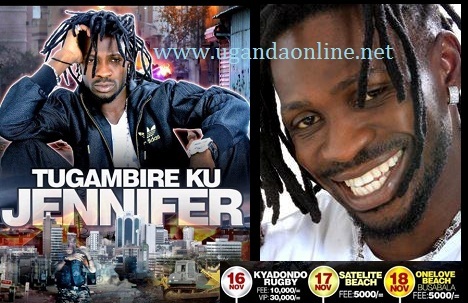 Bobi Wine Vs Bebe Cool Show, Who Won?